For anyone keen on keeping track of their whisky collection, Whiskybase will be a familiar name. But now the team has extended the company’s remit by launching its very own whisky festival, Whiskybase Gathering. Thijs Klaverstijn was there. For such a small country, the Netherlands has an incredible number of whisky festivals. From September to April, barely a weekend goes by without one taking place, ranging from big events such as the International Whisky Festival in The Hague to countless smaller festivals, and a very relaxed one (Maltstock) too. But there’s always room for one more. Rotterdam was named one of Lonely Planet’s Top 10 Cities in 2016. After being bombed to smithereens in the Second World War, The Netherlands’ second biggest city became a blank canvas for visionary architects. Now it is a modern, bustling, metropolitan city with the largest port in Europe. Curiously, however, Rotterdam was one of the few big cities in the country without its own whisky festival. 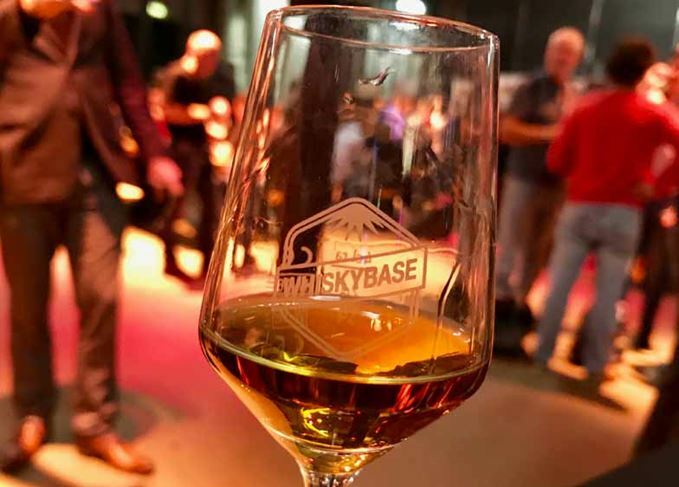 The city is also the home of Whiskybase, a crowd-sourced whisky database founded about eight years ago by Menno Bijmolt and Cees-Jan van Dijk. In 2011, the Whiskybase Shop was opened in Zwaanshals, Rotterdam, where it is now part of an up-and-coming neighbourhood with countless boutique retail outlets and eateries. In recent years the company’s founders have hosted numerous anniversary tastings for their shop, but for the fifth anniversary they went all out and the Whiskybase Gathering was born: a festival to celebrate independent bottlers and collectors. Their chosen venue was perfect for a whisky festival in Rotterdam. The Maassilo is a 100-year-old grain silo in the harbour district, converted at the turn of the millennium into an events space. A wonderful nod both to whisky and to Rotterdam’s deeply ingrained (no pun intended) history as a port city. More than 800 tickets were sold for the Whiskybase Gathering, but the Maassilo was easily big enough to accommodate everyone. There was time to chat with the exhibitors and to wander around freely. If you wanted to sit down with your friends to enjoy a dram, you didn’t need to look hard to find a couple of seats or benches. That’s not to say it was a quiet festival; there was plenty of energy from both visitors and exhibitors. Everyone was excited to be there, meeting up with old friends and making new ones. It’s no Lindores, the Belgian cult festival that attracted whisky fans from all over the world and sadly came to an end last year. But the Whiskybase Gathering certainly did have elements of Lindores across the show. Sure, it’s bigger and more modern. But it gave private collectors the opportunity to showcase their collections, and the crowd had the chance to taste incredible, otherwise long-gone bottles. That’s not to say you couldn’t find any new official distillery bottlings if that’s what you were after. After all, a couple of Dutch importers had their own stands – but they too mostly brought whiskies from the independent bottlers in their portfolio, like Gordon & MacPhail and Signatory Vintage. Where the Whiskybase Gathering excelled was at giving a stage to lesser-known independent bottlers, Whisky-Fässle from Germany, for example. Owner Jens Unterweger consistently picks great casks, but he has never attended a whisky festival... until the Whiskybase Gathering came around, that is. Kintra whisky is another one of those lesser-known indies. Erik Molenaar started his company in 2009 and he bottles a handful of casks every year. Earlier this year he took the plunge and started distilling in his own distillery in Deventer, the Netherlands. He introduced his latest gem – a Glenturret 1977 – at the show, which turned out to be one of the big hits of the Gathering. Also among the exhibitors was Phil Thompson from Dornoch distillery. He brought along an array of impressive whiskies from the Dornoch Castle Hotel and whisky bar, including the extremely rare Bowmore 1964 for the 30th anniversary of the Scottish Licensed Trade News, one of only three bottles created. And then there were the Whisky Nerds, or Bram van Glabbeek and Floris Kooistra as they’re known to friends and family. A 23-year-old Sherried Bladnoch 1966 from Dun Eideann blew me away. As did a Clynelish 1972, bottled by Glen Master in 2005. Most festivals I visit kind of revolve around the newest releases. Which Norse demi-god did Highland Park come up with this time? Or did you already drink the latest book release from Arran? Not at the Whiskybase Gathering. It was surprisingly relaxing to browse through the treasures the private collectors and small independent bottlers had to offer. Or maybe it actually wasn’t that surprising at all. It kind of felt like visiting a friend, and being invited to stay a while and have a dram from his collection. Except for one thing… these are not your average friends. Were smaller crowds the result of an early German heatwave, or a sign of festival fatigue? From affordable Famous Grouse to famed Black Bowmore, Glasgow’s rare whisky show had a dram for all. Offering over 2,000 whiskies, the Italian festival has become the largest in Southern Europe. Bigger than ever, the Dutch festival is a reflection of whisky collecting’s growing popularity.